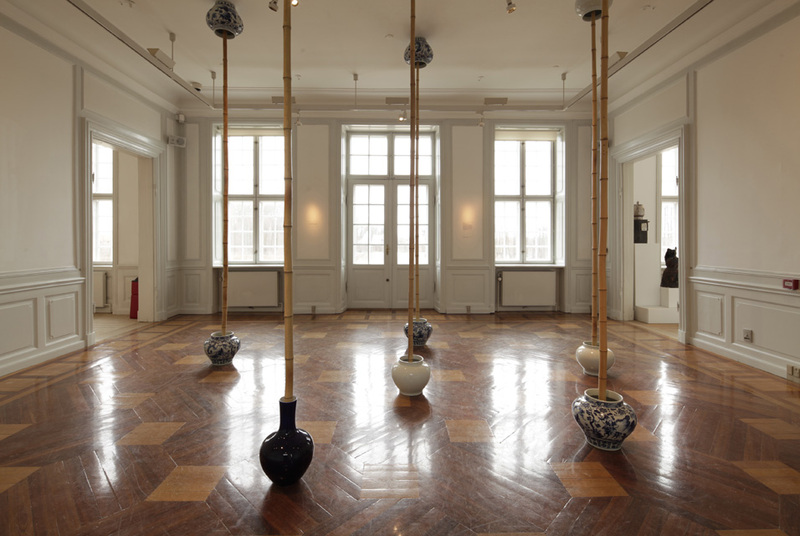 Ai Weiwei, Bamboo and Porcelain, 2008/2009. Gl Holtegaard, 2011. Photo: Anders Sune Berg. HOLTE.- ceramics as an artistic medium is once more making an impact on the international art scene. All over the world, artists are breathing new life into this many thousand-year-old material, creating works that range from well-known everyday cups and plates to the most grotesque forms of the fairytale. Gl Holtegaard, with its exhibition, on view from The Magic of Clay  ceramics in contemporary art, checks the pulse of ceramics in new art. The exhibition is on view from March 25 through July 3, 2011. Most people know the magical fascination of a lump of wet clay. Once the first imprint of a finger has been left on it, the creative process is underway and the clay has begun its transformation from a raw material into a finished form. For thousands of years, clay has entranced artists all over the world. Now Gl Holtegaard presents a new generation of artists who have all discovered the magic of clay. The exhibition The Magic of Clay  ceramics in contemporary art offers visitors a whole string of international artists who explore clay as a material in their many highly different ways. Based on the familiar and everyday, the exhibition invites visitors to meet an abundance of ceramic forms  from well-known cups and plates via sculpture and remarkable vases to films and imposing installations. What all the participating artists share is an attention to the mythological references of clay and its transformation from raw material to finished work. For the Chinese artist Ai Weiwei, the Ming vases signal, for example, the history of an entire civilisation, while the British artist Clare Twomey points to the transience of all things in her outdoor work. On the lawn in front of Gl Holtegaard, she has placed 1000 new porcelain items which the public are invited to walk over and crush to pieces in the process. History and tradition intersect with traces of the modern age in several works at the exhibition. The British artist Grayson Perry has become world-famous for his beautiful painted vases with their narratives of power, gender and sexuality. And the German artist Jonathan Meese unravels the whole German trauma about the war, the Übermensch and dreams of world hegemony in his violent sculptures. A recurrent theme at the exhibition is the alternation of the well-known and the imaginative, transience and the opportunity of coming to life once more. The Magic of Clay presents a series of new productions, with a number of works specifically created for the exhibition. This applies for example to a work by the Canadian Linda Sormin, who is at present in Copenhagen at artist residency to create her comprehensive installation. The Danish artists John Kørner, Kaspar Bonnén and Alexander Tovborg are also creating new works for Gl Holtegaard. The director of Gl Holtegaard, Mads Damsbo, says: With The Magic of Clay we are breaking new ground, exploring materiality as a point of departure for artistic creation. The exhibition asks the following questions: What particular possibilities does clay offer, and why are present-day artists so spellbound by this ancient material? I think the physicality of clay and the moment of transformation fascinates artists more than ever. There is an element of magic at work that modern humanity gets far too little of.